Cities—in America and around the globe—remain vitally important in fueling economic growth, producing jobs, and cultivating innovation and creativity. 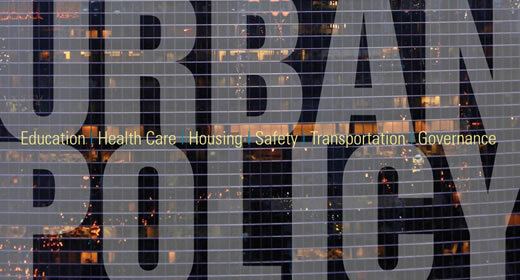 This edition of State & Hill features insights into city policy from faculty, alumni, and friends of the Ford School. Click through the page below to read stories about Barry Rabe and the future of CLOSUP (the Ford School's Center for Local, State, and Urban Policy); Liz Gerber and regional transit in SE Michigan; and a student-inspired, David J. Harding-led course based on the HBO TV drama, The Wire. Alums might also recognize stories about James (Jim) Hudak (MPP '71), Don Borut (MPA '65), Ruth Browne (MPP/MPH '83), Vibeke Brask Thomsen (MPP/MA '06), and Professor John Chamberlin. This issue also officially announces the Ford centennial button contest—wear one, share one—and looks back at President Ford's support for affirmative action ten years after Grutter v. Bollinger. Check your mailboxes—the Spring 2013 issue of State & Hill will be delivered soon. Let us know how we're doing—please send your comments and suggestions about State & Hill to fspp-editor@umich.edu">fspp-editor@umich.edu. If you would like to receive the next issue of State & Hill by mail, visit the sign-up page.